Endoscopic submucosal dissection (ESD) is a standard surgical technique that uses endoscopy to treat and/or remove noninvasive mucosal and gastrointestinal tumors, lesions and adenomas - - all of which are often precursors to cancer in the GI tract. 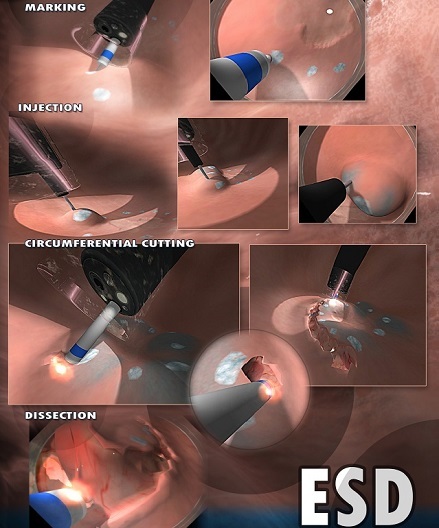 Though widely recognized as a complex medical procedure, ESD is a highly beneficial and minimally invasive endoscopic technique. In fact, its high rate of success in en-bloc curative resection has compelled more Western endoscopists to adopt ESD as a viable procedural method. However, due to its flat learning curve (mastery of this advanced endoscopic procedure requires a lengthy education period and demands considerable experience for practitioners to develop proficiency), training on human subjects engenders varying degrees of patient risk. In light of this, simulation training in ESD may be the most advantageous approach to acquiring procedural competency, expanding implementation in clinical practice, and reducing the number of patient complications. CAE Healthcare moves forward with innovation in healthcare simulation with the release of an endoscopic submucosal dissection module for its award-winning CAE EndoVR endoscopy simulator. Specifically engineered to be the most advanced high-fidelity simulator of its kind for quality training in upper gastrointestinal tract procedures, the endoscopic submucosal dissection module empowers learners with key skills development. CAE EndoVR, the first endoscopy simulator to have an advanced virtual reality ESD module, provides a safer practice environment for acquiring mastery in technically-challenging techniques. The ESD module will additionally offer residents-in-training, gastroenterology learners, and endoscopy technicians the advantages of unlimited and risk-free training in marking, injection, cutting, and dissection. Realistic exposure to scenarios in managing complications (bleeding, perforation, etc) is also a major benefit of this highly anticipated endoscopic simulator. Contact CAE Healthcare for updates on the availability of the ESD module. 2 Kaltenbach T, Soetikno R, Kusano C, Gotoda T. Development of expertise in endoscopic mucosal resection and endoscopic submucosal dissection. Tech. Gastrointest. Endosc. 13(1), 100–104 (2011).